We offer herbal teas made from high quality organic herbs grown in the foothills of Himalaya. These are in large cut and are naturally dried to retain their natural aroma and taste. These teas are available in 50 Gms packs and also 20 pyramid teabag packs (except Tulsi). Since these Herbs are in large-cuts, you should reuse them once more over 6-8 hours.Chamomile tea is also available mixed with Green tea. The Herbs go very well with Green teas as health benefits of both the teas are combined. However, Herbs need to be brewed at 99 degree C for 4-5 minutes while Green tea needs to be brewed at 80-85 degree C for 2 minutes. Therefore, the combined mix of Herbs and Green teas will need to be brewed as per the brewing requirements of Green tea to avoid bitterness. This means under-utilization of Herbs. The best way to make a nice Herbal tea mixed with Green tea is to first brew Herbs, and add Green tea leaves after 3 minutes.You can buy these herbal teas on our online tea store. Herbal tea is a generic term for tea made from herbs instead of tea leaves of the tea plant (Camellia sinensis). These are not really teas as they are not usually made from tea leaves but other types of plants. They are purely made of herbs without any tea leaves and are caffeine free alternatives to tea or coffee for a hot drink. Herbal tea is also known as tisane. The name notes that the tea is not made from tea leaves. Herbal tea can be made from fresh or dried flowers, leaves, seeds or roots. The tea is usually made by pouring warm to boiling water over the plant parts and allowing the mixture to brew for several minutes. If seeds or roots are used, they are often boiled separately before being used to make the tea. Tulsi- Tulsi or 'Holy Basil' is a prime herb in Ayurvedic treatment. Marked by its strong aroma and a stringent taste, the plant's extracts can be used to prevent and cure many illnesses and common ailments like common cold, headaches, stomach disorders, inflammation, heart disease, various forms of poisoning and malaria. It is often called "mother's medicine" of nature. Stomach problems such as menstrual cramps,stomach flu and ulcers. Lemongrass- Lemongrass is a citrus flavoured grass that is often used in cooking. It is known to have antibacterial and anti-fungal properties. It aids digestion by killing infectious microbes in the stomach, and relieves cough and nasal congestion.Lemongrass reduces anxiety and its oil is often used as relaxing perfumes and scents. Nettle- Nettle has anti-inflammatory and anti-allergic properties and is commonly used against hay fever, arthritis, eczema, asthma and urinary tract problems. Fresh nettle may be used to stop bleeding due to its high vitamin K content but is almost absent in dry nettle which may then be used as a blood thinning agent. Rhododendron- Collected from the clean mountain meadows of the Himalaya near Mount Everest, rhodendron clears the stomach and improves digestion. It is helpful with lung disorders involving general weakness of the body. It helps reduce fever and swelling of the abdomen due to the indigestion of food, restore the natural balance after changes in climate or water, and relieve numbness of the extremities, swelling and itching of the throat, or a feeling of thirst. 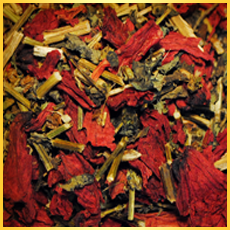 This tea helps balance five elements and improves physical well being.